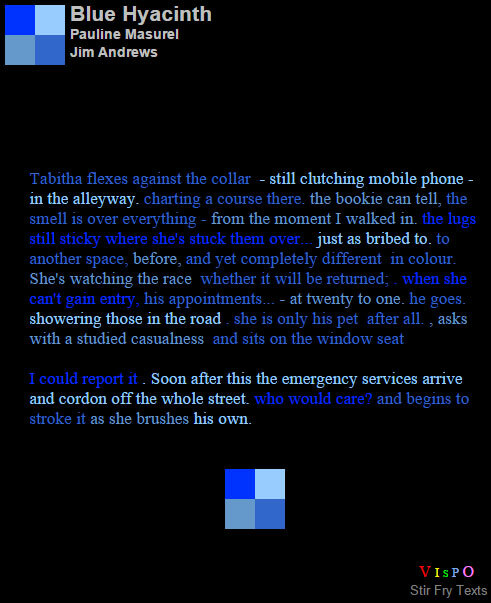 Blue Hyacinth is a stir fry text by Jim Andrews and Pauline Masurel. Masurel wrote the texts. Andrews did the programming and invented the stir fry form. The stir fry form consists of n texts. In Blue Hyacinth, there are four texts (n=4), each of which is a different shade of blue. You can view the text of a given color by clicking the square of that color. Each of the four texts somehow involve the blue hyacinth. Each of the four texts is partitioned into 30 parts. When the reader mouses over (or touches, if on a mobile device) part x of text y, that part is replaced with part x of text y+1. So the four texts begin to form a new text. There are several more stir fry texts and essays about them at vispo.com/StirFryTexts.